Today Britney Jeans Spears celebrating her 34th birthday! And to celebrate this, I, as one of the biggest Britney Army, a name for Britney’s fan, want to share reasons why I stan really hard for Britney Spears and not for the other pop stars out there. It’s a long story why I became a big fan of miss Britney Spears. I want to write everything about that day I discovered Britney Spears, but long story short: Blackout blew my mind. And yes: It’s only been 8 years since I became a fan unlike most of my friends who already stan for Britney since 1998. Blackout is one of the most influential album of all the time. It’s my favorite so far! But wait, aren’t all of Britney Spears’ album really good–maybe except Britney Jean? But why Blackout? It’s because all of Britney Spears’ album were made during her fit time. Meanwhile when she recorded for Blackout: It was her hardest time ever and she still managed to create such a masterpiece! RESPECT!!! In case you don’t know: She answered two questions at a time: one about Global Warming and one about Lady Gaga. but if you don’t know: damn. Was she drunk tweeting? Not only in Social Media, but also in real life. I mean she dresses like us, shops like us (she shops at Target!!! ), tweets like us, is a dork like us, and even queues like us! 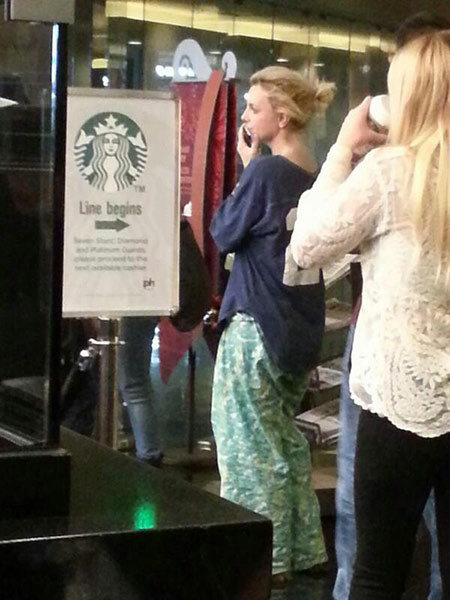 Instead of calling her bodyguards to bring her her own Starbucks, she waited in a line: just like us! Everything That She Does: ICONIC! She might now trapped in Planet Hollywood for the rest of her life. And that’s okay because she already gave us many iconic moments through her career even now she still managed to do that! Her singing and her dancing are iconic. Even her M&G Smile from Femme Fatale Tour is iconic. Nothing about her is not iconic. Remember when she managed to appear out of nowhere in Super Bowl commercial last year? The world went crazy. People barely talked about Katy Perry, she didn’t really slay the performance but The Left Shark saved the show to be honest, and Twitter was full of tweets related to Britney and her “ooooh”. And one time she had a wardrobe malfunction during her 3 Performance in her Vegas residency: The song managed to re-enter the chart! She’s iconic without even trying! Remember when she shaved her head in February 2007 followed by her disastrous yet iconic MTV VMA Performance? She then divorced and lost custody of her two beautiful sons. The world turned their back against her including some of her fans. Did she attempt to kill herself? No. Did she blame every single person on this planet? No. And what did she do? She raised from the ashes, like a phoenix, she proved the world that she’s not an ordinary female superstar. She handled every single problem like a pro and was back really hard, continued selling millions of albums and singles, had one of most successful world tour of all the time and now she’s back with her kids, family, and fans! Her Facial Expression is everything! She’s my favorite GIF reaction whenever I want to comment on something on Facebook or on another platform. Her facial expression is just priceless. Britney’s forum Universe and General Pop Forum Exhale have tons of Britney GIF collection! And yeah, sometimes I found myself doing her facial expression. Britney has always been a victim to many jealous stars out there and guess what, she doesn’t really give a single cent for that. Her main focus right now is not success anymore, I mean she still has it without even trying, but her family and her fans. That’s her main focuses! Even back then: when the other girl shaded her back and forth: she didn’t even bother to say a word. And look: Britney still slays life front and back. She’s the ultimate superstar. And by the other girl: I mean the one Wiz Kalifa referred to when he was interviewed. And what I really like about her is that she always is real to herself. She shows herself in public just like another human being around her. Her personality is so adorable. She is kind. She’s helpful. She even used the same clothes over and over again. She has tons of money, she can do whatever she likes but she chooses to life as a simple woman. A woman with her own weakness. She’s not a manufactured superstar who always appears perfect in front of public: she is not like that! And her imperfection is actually what makes her who she is today: Britney Jean Spears.